Well I hope everyone had a beautiful and loving Thanksgiving weekend! We were welcomed by my friend’s aunty’s and uncle’s house again, which we are so grateful for since we have no family in the Bay Area. Anyway I may have alluded to changes in our lives a couple weeks ago but didn’t want to delve into it until things were in motion (and now they are!). So we are getting out of our Airstream rental business. It was a wonderful passion project for 3 years, but now with a baby coming we need to get real and build a better financial base as well as get some premium health insurance. So the hubby and I decided to put our adult pants on, and go do the “responsible” thing and get a “real job”. Well he’s getting the real job and I’m going to be winding down the business and moving before the baby comes. Yep, moving again and I’m really living up to my blog name (lots of temporary homes!). Just 3 years ago we had a house near SF, which we sold to invest in this Airstream business. 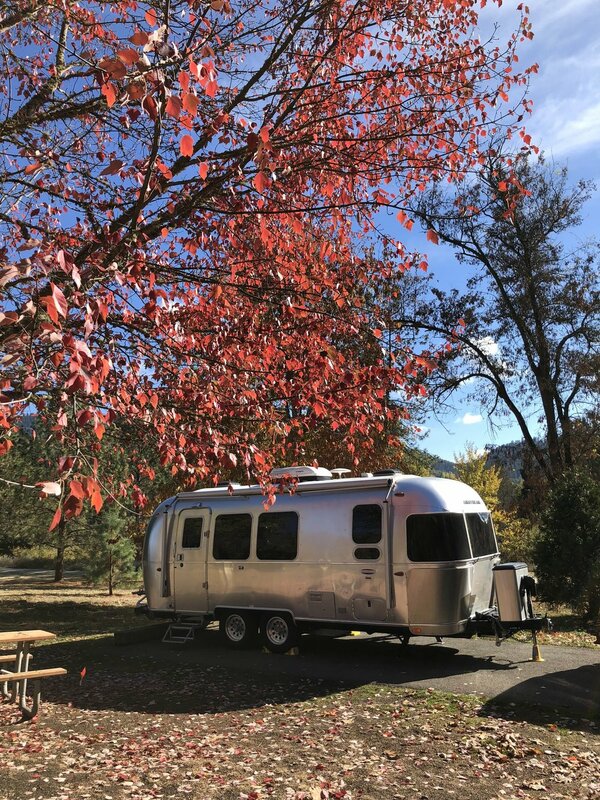 And then we moved into an Airstream for 2.5 years and then we moved into a bigger trailer for half a year, and then my mom purchased a house for us all to live together in in San Jose (you can see the move in my Insta-story highlights). Well long story short this house is too big for us and we cannot live with my mom (we learned the hard way). So we are striking out on our own into a modest condo in the East Bay (also to be closer to hubby’s work in the city). In 3 years we went from 2500 sq feet, to 225 sq feet, to 400 sq feet, to 2000 sq ft, now down to 1000 sq ft. I’m hoping the magic number for us is 1000 sq ft and that we will no longer be moving for awhile. I’m probably going to change the blog name next year too so I no longer “jinx” myself with a name that indicates temporary homes. Also I feel like the blog name doesn’t really represent anything that I talk about here. But blog changes will come in January once we are settled into our new place. Anyway, loved reading this guide on how to wear linen in the winter by Lee (something I’m definitely going to try out this year) and these reminders on keeping your shopping and thus your closet at a minimum. And finally I’m not into Black Friday shopping nor do I want to be a product pusher but I would feel remiss if I didn’t mention that my favorite silk Mara jumpsuit from Elizabeth Suzann is on sale now because they are phasing it out for a wide leg jumpsuit next year. Personally as a petite person I’m not a huge fan of the wide leg trend so I think the current Mara design is a huge winner (my review of it here). Also I feel like the shape is more of a classic that’ll last through the ages. In fact my secondhand silk version I got (which by the way was more expensive than this discounted price), has been my most worn item of clothing this past 3 months (at 14 times so far). I’m super tempted to get another silk version but I think I’m going to try out the linen one for some variety (but the silk is so dreamy). Anyway none of these are affiliate links and this is just a PSA for my fellow ES lovers out there! P.S. I’ve added more items to my Closet Sale benefitting the Wildfire Relief Fund! Thanks to everyone who’s purchased so far!